Professional Builder’s Lee Jones visits the Dulux Academy for a demonstration of the manufacturer’s latest Dulux Trade Vinyl Matt. When a product sells in quite the volume of Dulux Trade’s Vinyl Matt Emulsion it rather begs the question as to why the manufacturer would embark upon a root and branch reformulation in the first place. One in three cans of Dulux Trade interior emulsion sold is Vinyl Matt, totalling a colossal 17 million litres annually making it one of the go-to solutions for the professional painter and decorator – a reality which renders the success of its reformulation something of an imperative for one of the nation’s most recognisable brands. Of course, just because you’re the market leader doesn’t mean you don’t have to carry on improving and developing, and this certainly necessitates continuous refinement, but there are also more practical requirements. With the demands of the likes of EU legislation, certain compounds are no longer deemed acceptable as ingredients. Over time it’s no longer possible to continue to remove these without compromising performance, which then calls for a more radical rethink and, for the decorator accustomed to the old product, the changes to its new and improved successor will be immediately apparent. Gone is the familiar cottage-cheese consistency that often required thinning in favour of a greatly enhanced in-can consistency. 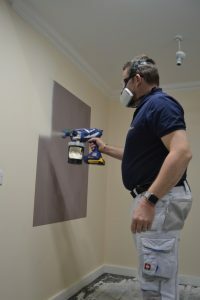 As with traditional matt emulsions the application of a mist coat on new plaster will require the dilution of the paint with around 20 per cent water, followed by two further undiluted coats, but on any conventional substrate only two coats will be required. 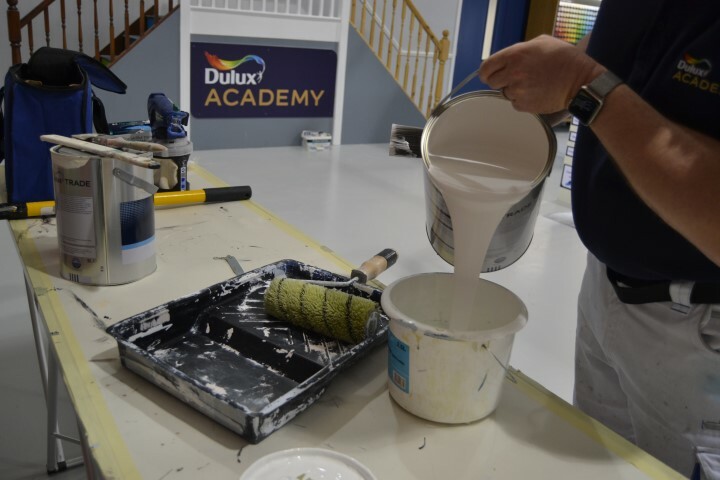 Dulux Trade puts considerable faith in the team at the Dulux Trade Academy and, once the benefit of their considerable experience is brought to bear on the new coating, it will be sent out into the wider world to gauge the opinion of the painting and decorating community. Dulux Trade is the kind of brand with which tradesmen will be so familiar that they will take ownership of it; it’s a product that they will use their entire careers and will be invested in as a result, so, as the Dulux Trade team will testify, candid opinions from seasoned decorators are always forthright.